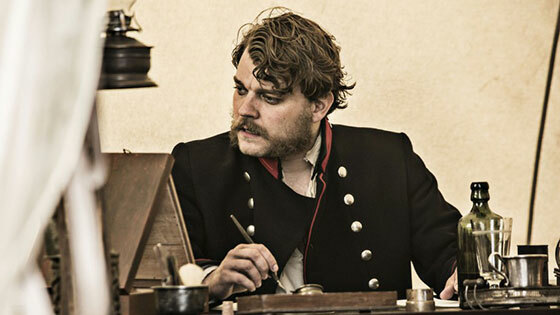 Over the past few Saturday nights I’ve been watching 1864, the latest BBC4 serial imported from Denmark. And the more I have seen of it, the greater my sense of déjà vu. The series depicts the 1864 war between the Danes and the Prussians, but all of its key tropes are familiar from the ‘futility’ school of Great War dramas. The first episode especially reminded me forcefully of that marathon of gloom, The Village. But when it comes to history, the series has a number of inaccuracies according to the historian Jens Ole Christensen, who has written a number of books on the subject. In particular, Christensen chided the series’s contention that a rabid nationalism propelled Denmark into war. Having said which, the programme is impressively made, and it’s good to see the actors from Borgen again, some of them sprouting impressive facial hair. This entry was written by George Simmers and posted on June 7, 2015 at 7:02 pm and filed under Film, History, TV with tags 1864, Denmark. Bookmark the permalink. Follow any comments here with the RSS feed for this post. Post a comment or leave a trackback: Trackback URL. Given the legendary complexity of the Schleswig-Holstein question, it seems hardly surprising that it has been simplified in a fictional treatment, but historians (both professional and amateur) always seize the chance to resent intrusion into “their” domain. From what I’ve read most of the criticism of 1864 has been about the amount it cost, but I agree that there is almost certainly a contemporary comment involved. Defeat in the 2nd Schleswig War was held to be largely responsible for Denmark steering clear of military entanglements for over a century, until recently involving itself in the US-led Iraq and Afghan conflicts. Naturally, this led to political debate in Denmark, as it did even in the UK. It seems hardly surprising that someone takes the opportunity to point out the unattractive aspects of war. The Danes are at least spared the additional burden of a recent history of military “success”. I don’t object to simplification, or to making history relevant. I just note that this series, well-made as it is, fits the history into a shape of an often-told story, rather than surprising us with something more original. I confess most of my knowledge of this bit of Danish history was as an episode in Bismarck’s creation of the German state (although at my school we seemed to concentrate more on Italy). But in Denmark, I think this is indeed an often-told story, with its own myths and echoes, so it’s hard to know how original the approach may be. Since they have no direct claim on the standard WW1 narrative as a version of the futility of war, it may even be quite original for them. But our interpretation is – as you say – governed by our own versions of the 1914-18 story. And presumably the BBC has only bought it because of the current popularity of Scandinavian noir (so gloom was rather the essence of the deal). Film makers always get so upset when anyone points out the gross errors in “their” domain. Denmark essentially became a German satellite as a result of the war, as we say, “Finlandized.” and thus the Germans controlled what Denmark could do in World War One and World War Two. Especially Denmark’s failure to ever stand up for democracy or human rights when challenged.